152 student members of UNISEC and 39 entries from the public took part in the workshop at Nihon Univ on Dec 8-9. UNISON Award: Matsunaga Lab, Tokyo Inst. of Tech. UNISAS Award: Matsunaga Lab, Tokyo Inst. of Tech. Tokai Univ Student Rocket Project team will present their project at Junshin Girls' Senior High School. 07.09.18 - Successful Launch of CEES-3A, Osaka Prefecture Univ. On Sep 13 (Thu), the non-combustion rocket CEES-3A, developed by Osaka Pref. Univ., reached 190m, obtained flight data, and deployed the parachute. From Sep 12 to 14, A Rocket Launch for International Student Satellites will be held in Nevada, USA, supported by AEROPAC. Eight Universities and 10 organizations from UNISEC will take part in the event. 1st: 32Б2m "KINGS" by Kyushu Inst. of Tech. and 35Б2m "Musashi" also by Kyushu Inst. of Tech. 1st: "B-DASH" by Yoshida-Nagatani Lab, Tohoku Univ. On Aug 18 and 19, Cansat competition, rocket launches, and rocket classrooms take place in Noshiro, Japan. UNISEC is one of the co-sponsors. On Aug 4 (Sat), the CAMUI Rocket of Hokkaido Univ. 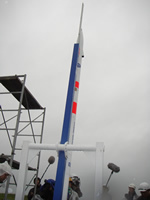 was successfully launched up to 3.5km at Taikicho, Hokkaido. The parachute was also deployed by the commands from the ground. Scheduled from Aug 3 to 6. Thank you for your patience. HACTIC will conduct a morning launch of the CAUMI rocket in Taikicho, Hokkaido on Aug 4. On July 28 (Sat), Kagawa hosted Cansat 2007. Six teams took part in the competition. 208 members attended the 5th general meeting at Tokyo Univ. on July 22. ARLISS is coming on September 12-14 in Nevada. Hiraki Lab (Space Dynamics Lab,) Kyushu Inst. of Tech. Space Propulsion Lab, Dept. of Mechanical Engineering, Osaka Inst. of Tech. General meeting will be held on July 22 (Sun) at New bldg. 2 at School of Engineering, Univ of Tokyo, following the UNISON-UNISAS meeting. The Tokai Univ team successfully launched their 10th hybrid rocket that reached 550m and released can sats on March 4 and 6. They also received the data from accelerometer, gyro, and magnetometer during the launch experiment. UNISEC hosted 195 participants from Japan and overseas. on Feb.23 and 24 in the Takeda Hall, Univ.of Tokyo.